What we walked: 200km? There are a couple of different route options at different spots. Start point: Killarney - looped walk, so also end point! Although quite a few people end at either Kenmare or up near the black valley, where the loop reconnects, instead of walking the whole way back into Killarney. Beware, there isnâ€™t a straightforward way of getting back from the split! One of the most famous, and therefore best developed of the National Waymarked Trails! 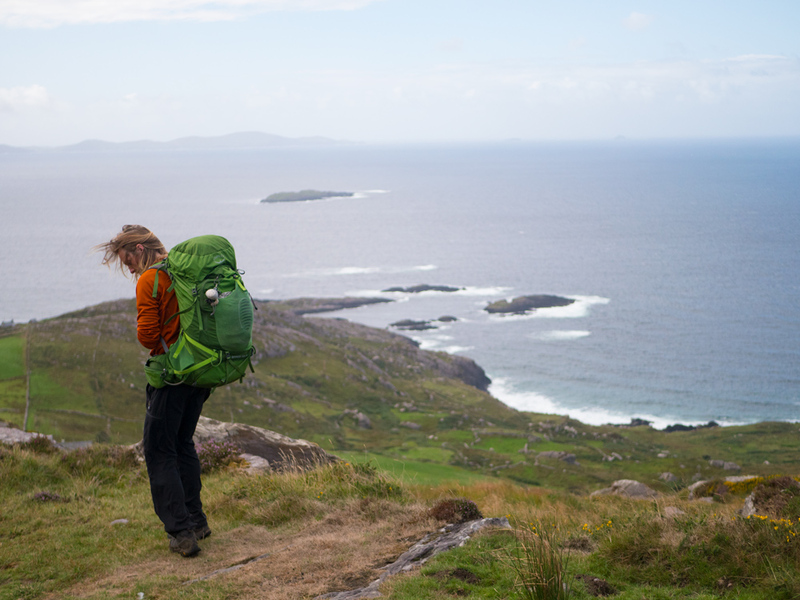 Camping/accommodation: The Kerry Way has some of the best infrastructure out of all of the Irish National Waymarked Trails. We camped in campsite in Killarney, stayed in a hostel in Black Valley and Glencar. We then wild camped outside of Glenbeigh, and stayed in another hostel in Cahersiveen. We stayed in a hotel in Waterville and Sneem, followed by a final hostel in Kenmare! There werenâ€™t as many official campsites as I would have liked, and while weâ€™re happy to wild camp, it was such a busy area that we decided just to go with the hostels. This blog post contains the second half of our trip, from the morning of Day 5 leaving Cahersiveen, to finishing the trail on Day 8. We woke up on day five to the sound of rain on the skylight of our hostel. It looked like our day to Waterville would indeed involve a lot of wetness. We got up very slowly, making it as far as the petrol station across the road before our first coffee stop of the day. Tired and not wanting to set out into the rain, we sat around until 10am, knowing we needed to leave but dragging our feet. After some extra sugar we just started walking without thinking about it too hard. We knew that having started so late it was going to be a long day. It drizzled as we made our way back up to the split for Cahersiveen, our feet squelching all the way. That day of walking consisted of two ridge-line walks. It was a climb up to and then on past the split, and as we made our way up the slippery slopes we passed through the cloud line. Inside the clouds itâ€™s harder to notice it â€œrainingâ€�, but if you look down at all your gear you notice that itâ€™s saturated. As we made it up onto the first ridge of the day the wind whipped the clouds fast around us, pulling at our layers. We caught our breath, and for a moment had the most beautiful view back down over Cahersiveen as the clouds were swept aside for a moment. But then we were consumed again, and the following hours can only be described as going up and down, and up and down, and up and down boggy mountains, under a thick grey blanket. A couple of hours in we stopped for some intense map staring. The longer we stared the harder the realisation was at how little ground weâ€™d covered in that time. Itâ€™s funny how you can feel like youâ€™re going flat out at your regular hiking pace, but the bog just swallows it all and reduced you to what seems like crawling. At 5pm weâ€™d finished the first ridge section of the two and were making our way along the roads between. It had taken us four hours to walk what looked like only 4 or 5 kilometres. It was on this road section that we called ahead and booked into the only option we could find - The Bay View Budget Accommodation. It was unlikely that the second ridgeline would be any drier than the first, and neither of us fancied camping in a very wet bog that night. Thankfully the weather was improving, and as we made it to the second ridge line we were no longer surrounded by clouds. It felt like we were gingerly running (sore knees and waterlogged feet protesting) for the last 6km, rushing our way along that second ridgeline. The views were finally clear, and even though we were pushed for time I did manage to notice how beautiful it was. We made it to Waterville as the sun was setting, and stood (a little numbly) watching it disappear behind the peninsula across from us. We checked into the Bay View and slowly wandered through this very old hotel. Or at least, it had once been a hotel. It felt like weâ€™d stepped back in time to the sixties. We kind of liked it, in our wiry state. We sat on the floor eating chocolate for dinner. We worked out that we had averaged about 3km an hour, spending over 10 hours on the move that day. I laid out the cleanest looking of all my socks - Iâ€™d put on my last dry pair three days ago, and my feet were swollen from all the water. I fell asleep rubbing cream into them. The Bay View Budget Accommodation cost us â‚¬60 for the night, including a large buffet breakfast and a bottomless coffee pot that we took full advantage of. This might sound like an expensive â€œbudget accommodationâ€�, but for two people itâ€™s pretty okay for Ireland: hostels tend to be about â‚¬20 per person, and at â‚¬30 each we get our own room, en suite bathroom, and breakfast the next morning. B&Bâ€™s/Hotels on a cheap day start at â‚¬75, but can often be â‚¬90 a night (again for two people). Once weâ€™d finished overeating, we started to make our way out of Waterville. The town itself seemed nice, and the day started with blustery sunshine. As we made our way out of the town we walked past a large, ornate golf course on our left, and an old yellow house with helicopters on the front lawn on our right. As we passed, another jet black helicopter flew over us to land beside the others, and we spent the first half an hour thinking up ridiculous stories as to why they were there. As we left the town behind us, we got to experience a new first: huge dark rain clouds built up and tumbled in from the water out to our right, but as we rushed to pull jackets on, we got to watch it hit the town behind us and leave us completely dry - or at least, not make us any wetter. Weâ€™ve had countless moments where weâ€™ve looked out and seen the weather changing, knowing that it was going to hit us eventually. It was quite bizarre to see all that rain build and move towards us but miss hitting us by maybe a kilometre. The trail took us up along some small grassy paths, and as we made our way up the most bizarre sight was making its way down towards us. Plucked straight from a feel-good ad, two ESB maintenance men were making their way down the mountain carrying large ladders and spools of cables. The guy in from wave enthusiastically, seeming the more experienced of the two as he looked like he was just strolling through the park. His companion behind him looked a little younger, and a bit worse for wear. Being a stormy coastal area, I guess it shouldnâ€™t have been surprising to see them having to carry out maintenance work on the side of a mountain, but all around us was just wild heather and grass. At a road/trail junction, we came across an old hiking boot missing most of its sole. It was hanging defiantly from the top of a post. As we approached it was high above the trail, itâ€™s last hurrah to look down on the other walkers approaching. But when we climbed up the stile and onto the road it ended up being only shoulder high, and as we walked away it looked a lot more defeated than defiant. We took the coastal route to Caherdaniel, and that morning/early afternoon of walking was beautiful. It stayed mostly dry, and the views out over the water were fantastic. We walked through deciduous forests all bright greens sunlight, crossing small streams on bridges that looks hundreds of years old. With the weather unpredictable nature we spent most of our time on this trail taking off and hastily pulling back on layers and layers of clothing. I think one of our lasting memories will be of just how sweaty we were - sometimes just willing to feel gross for a while because the thought of stopping yet again to take off our jackets for the fortieth time was becoming mildly frustrating. But even the weird, crazy weather couldnâ€™t colour our views. When we stopped in Caherdaniel, we sat at the pub drinking coffee(s) and discussing what weâ€™d walked so far that day. Sections of what weâ€™d walked were parts of what was once locally known as the â€œbutter roadâ€�. Comparing it to the day before highlighted just how far Irish weather and trails lived in extremes; gently winding forest trails in the sunshine, and windswept boggy ridges in the torrential rain. The beauty of todayâ€™s picturesque wandering was competing strongly with the Glencar - Glenbeigh stretch for prettiest trail section. In Caherdaniel is where most people would end their day. Our plan for Day 6 was an ambitious one - we were combining it with the next days walking, continuing onto Sneem that afternoon. To keep things complicated for myself, Iâ€™m writing this blog post as two parts, but we edited the videos into three sections. Video Two ends on here, just as we left Caherdaniel. It was 3pm when we left Caherdaniel, with roughly 15km to go to Sneem. Just outside Caherdaniel is a sculpture of all the planets to the correct distance scale - so while Mercury, Venus, Earth and Mars were all close to Caherdaniel, it the walks between each planet got further and further as we walked. Carl also had an interesting point - that this was the only sculpture weâ€™d come across that was exclusively for walkers. You see large sculptures along motorways all the time, but this was the first one that weâ€™d come across that you could only experience walking. The next stretch of trail was along passages between farmland; grassy paths that were intermittently dissected with gates. It was pretty easy walking, but we were a bit dead on our feet. Most of our days were long days, but it was rare that we went 6 days in a row without a break, and as we were making our way to Sneem I understood why there were two short days towards the end of the trail - it would have offered us some time to recover. Part of the reason weâ€™d chosen to combine them, was just to cut the cost of having an extra day on the trail. At this point in the project our pockets were pretty empty, and it was a tricky balance knowing we needed to be as frugal and cheap as possible, but also wanting to take advantage of the hostels along the way, needing to dry out or gear at every opportunity. Right around where the above photo was taken, Carl and I drew a line in the ground, and stepped over it together. It was just symbolic, we didnâ€™t actually know where exactly this line would be â€¦ but it marked us passing 3,000km of walking. And that was a pretty nice moment to have. After that, the walk to Sneem wasnâ€™t very eventful - itâ€™s always the end bit that gets seared into my memory, and sadly the last section of that day wasnâ€™t great; a trail had been cut into the landscape around it, as opposed to being part of it, and the hard rock under our feet wasnâ€™t much better than walking on a road. After a while, this road-like trail turned into a road, and that was it for us from there into Sneem. The village of Sneem wasnâ€™t really for us, with lots of tourists and very pricey food. However, we did still manage to dawdle and sit around that morning, not leaving Sneem until midday. By 2:30pm weâ€™d only walked about 7km. This area of Kerry is known as the Kerry International Dark-Sky Reserve/Area. It was designated Ireland's first International Dark Sky Reserve by the International Dark-Sky Association. The International Dark Sky Places (IDSP) Program was founded in 2001 to encourage communities, parks and protected areas around the world to preserve and protect dark sites through responsible lighting policies and public education. This area in Kerry is one of only 100 or so places in the world that has this award/protection. As we continued along this trail, we talked about what exactly made this such a â€œgood trailâ€�, and came to the decision that a huge factor to how good a trail was in our books, was how often the trail varied. A really well thought out trail can contain 40% road, but if the developers have managed to intersperse these sections around and throughout the trail, as opposed to it just being one long, painful road section, the trail is really fantastic. It probably helps that with so many people walking this trail and bringing money to the area, there would be more funding to keep improving the trail and infrastructure. It was funny that on this day we also found our second four-sided Elvis. We were 18 months into the project until we came across our first, and then we found the second one four days later. As evening closed in the rain started to come down, and the trail drove us crazy as it twisted back and forth, up and down the N road into Sneem. We called ahead to make sure there was room in the hostel, and that it would still be open at 8:30/9:00pm. We just about made it, once again exhausted and soaking. Our dorm room was pretty empty as we dropped our packs, but quickly filled up around us. I peeled off my shoes and socks, putting them under the bunkbed. After a few minutes Carl got up and moved them outside the room, not wanting everyone in the room to pass out from the smell. We ate breakfast with the other hostelers, enjoying the free toast, conversations and coffee, heading out the door at a reasonable enough start time. Sadly, this meant passing all the amazing-looking coffee shops by. There was even a bakery. My heart still pines for it. The walk out of Kenmare is a long, slow up hill. The weather was still insisting on a continuous drizzle. Carlâ€™s spirits were low that morning, and my meagre attempts at rising them fell short and tumbled into puddles. Exhaustion took hold of him maybe half way from Kenmare to the split weâ€™d turned right at over a week ago. He sat down on the ground, immovable for quite a while. I felt terrible for dragging him out of bed that morning, but it was something that weâ€™d both had to do for each other throughout the project. A question we get asked quite often is â€œwhat happens when you both have a bad dayâ€�, and so far it had never happened that we both had a â€œbad dayâ€� at the same time. We might both be feeling like absolute dirt, but when one of us breaks the other one is there to tug them along and get them to the end point. The evening before, as weâ€™d zig-zagged back and forth across a terrifyingly busy N-road, walking further and further but feeling like weâ€™re not making any progress, Iâ€™d had one of my bad moments, and now here was Carl, the lowest Iâ€™d seen him. Itâ€™s not easy, and I wasnâ€™t sure I was doing the right thing, but we got to our feet again and continued on. It was as we were standing in yet another cloudy hilltop, filming a quick intro, that we spotted a deer behind the camera. We both stared at it, whispering excitedly and taking a couple of pictures. The deer looked back at us, chewing on its mouthful of long grass and seeming to look down on us little hikers for getting so excited over its presence. We wondered how long it had been there, as before weâ€™d been filming we had just been standing there talking at regular volume, assuming we were alone. After a while of silent watching we decided to move on and let it munch in peace. Our misty walk through the valleys near Killarney were just as magical as when weâ€™d been in this area during the first few days of the trail. We met some other walkers and mountain bikers, talking to other people giving us an extra lease of energy. We made it to back to the split, touched the sign and sighed with relief. It was done! The longest trail on our list was ticked off, and weâ€™d officially gone the longest stretch weâ€™d ever done without taking a rest day. We walked back to where the trail met the road, and tried to thumb a lift. Most people acted like we didnâ€™t exist, and just as we thought we mightnâ€™t be able to get back to Killarney without walking, a minibus pulled over. It was just a regular bus who did a loop of the area, ferrying tourists between the best viewpoints and attractions. So we paid the surprisingly low fare and took our seats, relief flooding through us. This was our final trail of 2018 - we got back to Killarney, and that night took a train to stay with some family for a few days of sleep. After sleeping, we had to face the reality of adventures; weâ€™d run out of money. And so our current trail total stands - 35 trails walked, 7 left to go! Since then weâ€™ve been working (Iâ€™m also back studying), and hopefully will be hitting the trails again in a couple of weeks/months. Itâ€™s funny how it was Kerry that was our last trail for each year - I broke my foot on the Dingle Way at the end of August 2017. With so little left to walk, weâ€™re both incredibly excited to get back out there and finish it all. Here is the link to the Kerry Way Part 3 Video. Want to get emailed when we have new blog posts? Press the button below! Get Our Blog In Your Inbox! What is Leave No Trace? What is the Beara Breifne Way?